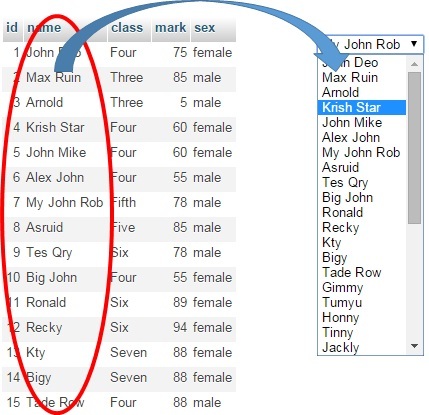 We can add options to a list box by using records from a database table. Records from table will be returned in JSON string format and jQuery will be used to add options to list box. For this example we will keep three pages. This is the front end page to display the list box with JQuery code to collect the data. We have used PHP PDO to connect to database table where we kept our student table. You can create your table by using sql_dump of the student table. We first connect to database by using config.php file. Using this array we print the Json string. This script creates the dropdown list box and by using getJSON function we will connect to our backend script student-data.php and get the JSON string of data. Now using each loop we will create one string to add options to our listbox. "<option value=" + value.id +">"+value.name+"</option>"
In the HTML part we have the student dropdown list. Here is the complete code of student-list.php page. By using above code we have displayed a list box, now we will trigger or execute further code to know the option selected by the user. For this we will use jQuery change function. This function will be fired when any option is changed by user. In our student dropdown list we have student ID as option and student name as text displayed against each option. Inside your zip file this code is kept in a separate file student-list2.php file.